Emerging applications of AR devices in the retail sector are growing at a rapid pace in North America Augmented Reality Market. The applications of this technology in the sector are attracting the customers and providing them with information about the products & services of the company. Several retail companies have installed these devices in their stores, providing visual merchandising of these products. For instance, Charlotte Tilbury has installed magic mirror AR technology. It has partnered with Holition, a software provider to install such mirrors. 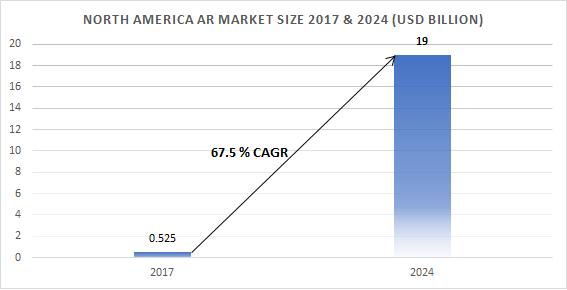 According to the Graphical Research new growth forecast report titled “North America (AR) Augmented Reality Market size will exceed USD 19 billion by 2024. The applications of the technology in the healthcare sector are providing advanced techniques to analyze and test the disease of a patient. These devices are used for describing the symptoms by the patients, finding the veins & organs, and providing them proper medications depending on the type of the disease that has affected them. Several major players in the North America Augmented Reality Market are offering technologies, which will support the healthcare applications. For instance, Medsights Tech is working on creating a software, which will test the feasibility of the AR technology in creating 3D reconstruction images of tumors. The key players operating in the North America Augmented Reality Market include Facebook, HTC, Intel, AccuVein, Inc., Affectiva, Inc., APX Labs, Google, Inc., and Microsoft Corporation. These players in the North America AR Market are targeting the healthcare sector wherein a high demand for these devices can be witnessed for the treatment of several diseases. In February 2018, Intel Corporation developed AR smart glasses, which project the information directly to the retina of the observer.